Seemingly wrinkled and toothless, with sagging jowls, the face of a Roman aristocrat stares at us across the ages. In the aesthetic parlance of the Late Roman Republic, the physical traits of this portrait image are meant to convey seriousness of mind (gravitas) and the virtue (virtus) of a public career by demonstrating the way in which the subject literally wears the marks of his endeavors. While this representational strategy might seem unusual in the post-modern world, in the waning days of the Roman Republic it was an effective means of competing in an ever more complex socio-political arena. This portrait head, now housed in the Palazzo Torlonia in Rome, Italy, comes from Otricoli (ancient Ocriculum) and dates to the middle of the first century B.C.E. The name of the individual depicted is now unknown, but the portrait is a powerful representation of a male aristocrat with a hooked nose and strong cheekbones. The figure is frontal without any hint of dynamism or emotion—this sets the portrait apart from some of its near contemporaries. The portrait head is characterized by deep wrinkles, a furrowed brow, and generally an appearance of sagging, sunken skin—all indicative of the veristic style of Roman portraiture. Verism can be defined as a sort of hyperrealism in sculpture where the naturally occurring features of the subject are exaggerated, often to the point of absurdity. 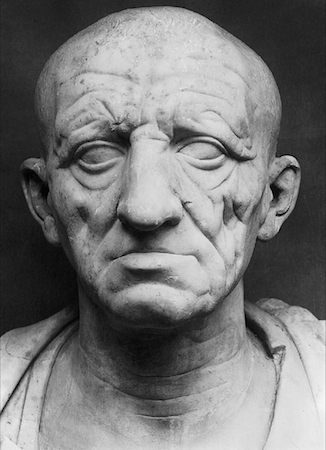 In the case of Roman Republican portraiture, middle age males adopt veristic tendencies in their portraiture to such an extent that they appear to be extremely aged and care worn. This stylistic tendency is influenced both by the tradition of ancestral imagines as well as a deep-seated respect for family, tradition, and ancestry. The imagines were essentially death masks of notable ancestors that were kept and displayed by the family. In the case of aristocratic families these wax masks were used at subsequent funerals so that an actor might portray the deceased ancestors in a sort of familial parade (Polybius History 6.53.54). The ancestor cult, in turn, influenced a deep connection to family. For Late Republican politicians without any famous ancestors (a group famously known as ‘new men’ or ‘homines novi’) the need was even more acute—and verism rode to the rescue. The adoption of such an austere and wizened visage was a tactic to lend familial gravitas to families who had none—and thus (hopefully) increase the chances of the aristocrat’s success in both politics and business. This jockeying for position very much characterized the scene at Rome in the waning days of the Roman Republic and the Otricoli head is a reminder that one’s public image played a major role in what was a turbulent time in Roman history. K. Cokayne, Experiencing Old Age in Ancient Rome (London: Routledge, 2003). H. I. Flower, Ancestor Masks and Aristocratic Power in the Roman Republic (Oxford: Clarendon Press, 1996). E. Gruen, Culture and National Identity in Republican Rome (Ithaca: Cornell University Press, 1992). D. Jackson, “Verism and the Ancestral Portrait,” Greece & Rome 34.1 (1987):32-47. D. E. E. Kleiner, Roman Sculpture (New Haven: Yale University Press, 1994). M. Papini, Antichi volti della Repubblica: la ritrattistica in Italia centrale tra IV e II secolo a.C. 2 v. (Rome: “L’Erma” di Bretschneider, 2004). G. M. A. Richter, “The Origin of Verism in Roman Portraits,” Journal of Roman Studies 45.1-2 (1955):39-46. J. Tanner, “Portraits, Power, and Patronage in the Late Roman Republic,” Journal of Roman Studies 90 (2000), pp. 18-50. Cite this page as: Dr. Jeffrey A. Becker, "Head of a Roman Patrician," in Smarthistory, August 8, 2015, accessed April 21, 2019, https://smarthistory.org/head-of-a-roman-patrician/.